I sat down for lunch with Lena Korres, the impossibly chic founder of her namesake skincare company, Korres. The fact that she shares a name with the brand speaks to the time-tested, apothecary feel of the family-owned business. George Korres, her husband and co-founder, worked in Athens's oldest homeopathic pharmacy, where he first began mixing natural pharmacy ingredients to create natural remedies in 1988. Now, led by their pharmacy heritage and understanding of herbal remedies, Korres develops products based on clinical efficacy and the benefits of natural ingredients. Inspired by her story, I began testing, smelling, and applying all the new products she presented at the table. 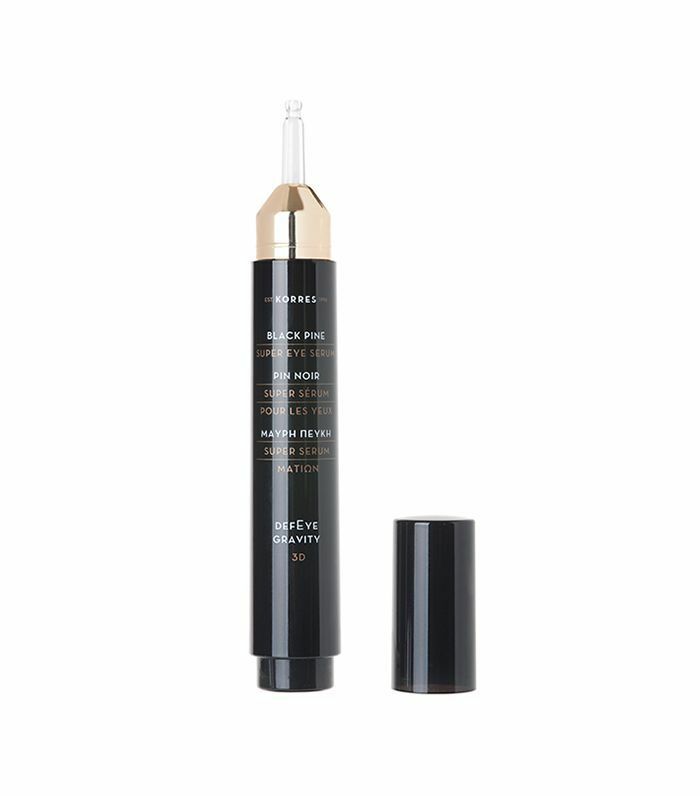 One glossy black tube in particular caught my eye, the Black Pine 3D Sculpting, Firming & Lifting Super Eye Serum ($65), and before I knew it, I was massaging the serum-y formula into my skin. "My eyes feel so tired," I told her and I continued my facial massage. Almost immediately, my skin felt soothed, supple, and cooled. Honestly, that would have been enough for me. But when I excused myself to go to the bathroom, I noticed a visible lift in sensitive skin around my eyes as well as my upper eyelid. Turns out the formula was actually made to be used across the entire eye area, including the eyelid, to create the appearance of a firmer, more lifted, and sculpted eye contour. In fact, it's meant to support the "natural production of collagen and elastin while diminishing the appearance of dark circles, fine lines and wrinkles, and puffiness," Korres tells me while applying the product herself. To create it, they used a combination of rare natural actives that work on achieving a "more lifted look" naturally and without more invasive solutions. And the suppleness I felt? It was courtesy of hyaluronic acid, which provides rich hydration and keeps under-eyes more resilient to environmental aggressors. The hero ingredient, though, is potent black pine extract from trees in the Mediterranean. The company's research showed that the extract supports the natural elasticity of the connective tissue better than all other polyphenols studied. Since that afternoon, I've been using the gel-like serum every single day (usually three times a day, if I'm being honest), and the results have only gotten better over time. I'm (admittedly) snobbish when it comes to eye creams, and this one is my new top-shelf pick. What are your favorite eye products? Let us know in the comments below, and check out our other (honest) product reviews.